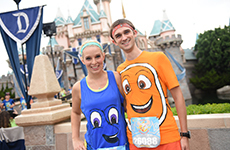 Registration is now open for the Disneyland® Half Marathon Weekend presented by Cigna® . Register today! 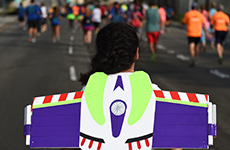 Race to infinity and beyond as we celebrate Pixar during Disneyland® Half Marathon Weekend presented by Cigna®! Get set for a magical Pixar weekend of fun-filled runs during the happiest races on Earth for the 2017 Disneyland® Half Marathon Weekend. 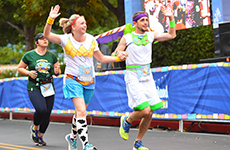 The excitement goes “To Infinity and Beyond” during the Disneyland® Half Marathon, which celebrates some of our favorite “Toy Story” characters, including Buzz Lightyear and Woody. 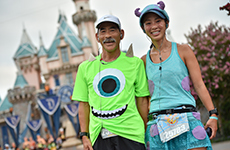 Then it’s everyone’s favorite scarers from Monstropolis, Mike and Sulley, who scare up plenty of fun and surprises during the Disneyland® 10K. 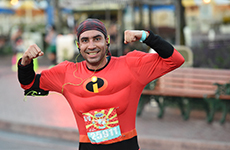 And this year’s Disneyland® 5K will be the most incredible ever, hosted by our favorite super hero family from “The Incredibles.” Plus, there’s the ultimate challenge, the 5th Anniversary Disneyland® Double Dare, runDisney Kids Races, Disney entertainment, and much, much more. 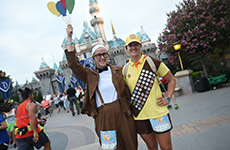 Join the Pixar gang and sign up today for a memory-making weekend of fun and great runs! 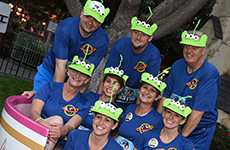 Join the “Toy Story” gang for the Happiest Race on Earth! You’ve got a friend in runDisney and the gang from “Toy Story” for a magical 13.1-mile run through the “Happiest Place on Earth!” Your amazing run will take you through Disney California Adventure® Park, Disneyland® Park, the Disneyland® Resort and the streets of Anaheim before a fantastic “Toy Story” celebratory finish. It all adds up to a race that takes runners “To Infinity and Beyond” with miles of smiles and unforgettable moments. * Participants must attend Packet Pick-up at the runDisney Health & Fitness Expo to receive their race packet, bib, and tech shirt. Finisher medals will be distributed to finishers at the conclusion of the race. None of these items will be mailed to registrants. 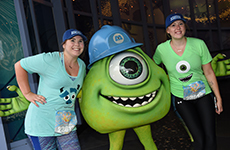 Be a part of Monsters fun and 6.2 miles of magical runs! It’s time to scare up some great runs with some of our favorite Monsters, Mike and Sulley, for the Disneyland® 10K! The race starts on the streets of Anaheim, passing through the Grand Plaza of the Anaheim Convention Center before entering Cars Land at Disney California Adventure® Park. You’ll continue into Disneyland® Park, down Main Street, U.S.A., before completing the final stretch of the course and arriving at the scare-tastic finish line! Dates, times, prices and inclusions subject to change. All races are subject to capacity limits and may close at any time before the percentage can be updated. Registrations are non-refundable and non-transferrable. Disney reserves the right to refuse the entry into, and/or revoke any registration for, any race for any reason in its sole discretion with refund of any applicable registration fees being the sole remedy of any such refusal and/or revocation. *Participants must attend Packet Pick-up at the runDisney Health & Fitness Expo to receive their race packet, bib, and tech shirt. Finisher medals will be distributed to finishers at the conclusion of the race. None of these items will be mailed to registrants. 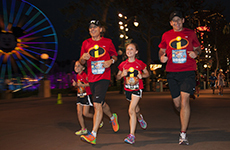 Enjoy 19.3 miles of fun in the ultimate Pixar adventure over two days! This year’s Disneyland® Double Dare will not only be celebrating Pixar but will also be commemorating the fifth anniversary of the challenge! 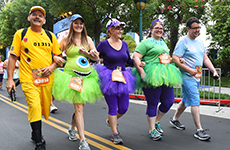 Disneyland® Double Dare combines the 10K on Saturday with the Half Marathon on Sunday – totaling 19.3 miles through the magical Disneyland® Resort. If you finish both races within the pacing requirements, you will be awarded the 5th Anniversary Disneyland® Double Dare medal in addition to your Half Marathon and 10K finisher medals. 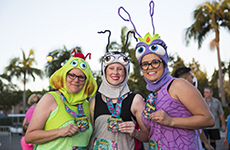 You must register for the Disneyland® Double Dare to receive the Challenge medal upon completion of both races within the pacing requirements. To receive the Disneyland® Double Dare finisher medal, you must register for the Disneyland® Double Dare. Registering for the 10K and half marathon individually will not make you eligible to receive the Disneyland® Double Dare finisher medal. 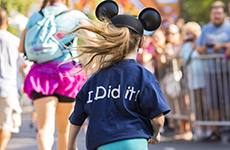 Both the 10K and the half marathon as part of Disneyland® Double Dare must be completed within the time allotment to qualify for the Disneyland® Double Dare finisher medal. Incredible runs and spectacular family fun! Join Mr. and Mrs. Incredible to see how far you can stretch your running abilities on this incredible 3.1-mile run, perfect for the whole family to enjoy. It’s an amazing sunrise run throughout the spectacular Disneyland® Resort! Plus, there are plenty of surprises along the way and at the finish line to celebrate your accomplishment. Runners of all levels and ages – adults, teens, and children ages five and over – are invited to join in the incredible fun! 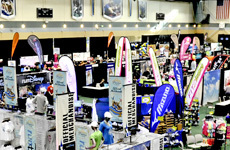 * Participants must attend Packet Pick-up at the runDisney Health & Fitness Expo to receive their race packet, bib, and t-shirt. Finisher medals will be distributed to finishers at the conclusion of the race. None of these items will be mailed to registrants. 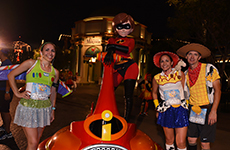 “Adventure is out there” for the little runners who want to get in on the runDisney action! 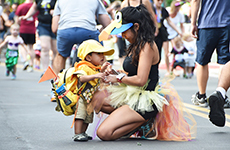 The runDisney Kids Races presented by GoGo squeeZ® Applesauce on the Go will be celebrating “Up” where every Wilderness Explorer will have the chance to earn his or her very own finisher medallion! 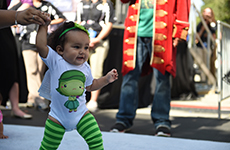 Adventure awaits for your young runner in the Kids Dashes or Diaper Dash during this fun-filled weekend. Space is limited. Parents are allowed to run with their children. Dates, times and prices subject to change. Some runDisney Kids Races event categories may fill up before others. All races are subject to capacity limits and may close at any time before the percentage can be updated. Registrations are non-refundable and non-transferrable. Disney reserves the right to refuse the entry into, and/or revoke any registration for, any race for any reason in its sole discretion with refund of any applicable registration fees being the sole remedy of any such refusal and/or revocation. * Participants must attend Packet Pick-up at the runDisney Health & Fitness Expo to receive their race packet, bib, and t-shirt. Finisher medallions will be distributed to finishers at the conclusion of the race. None of these items will be mailed to registrants. 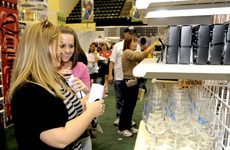 If you are interested in becoming an exhibitor at one of our runDisney Health & Fitness Expo events, please contact wdw.sports.marathon.expo@disneysports.com. A variety of Official Disneyland® Half Marathon Weekend merchandise will be available for purchase at the Expo. 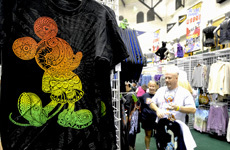 For additional runDisney merchandise available outside of race weekend, visit us online.